Omni capsule and a package of accessories that includes a pouch, windshield and a WiFi 8GB SD card for use with the Yellowtec UpLink app. 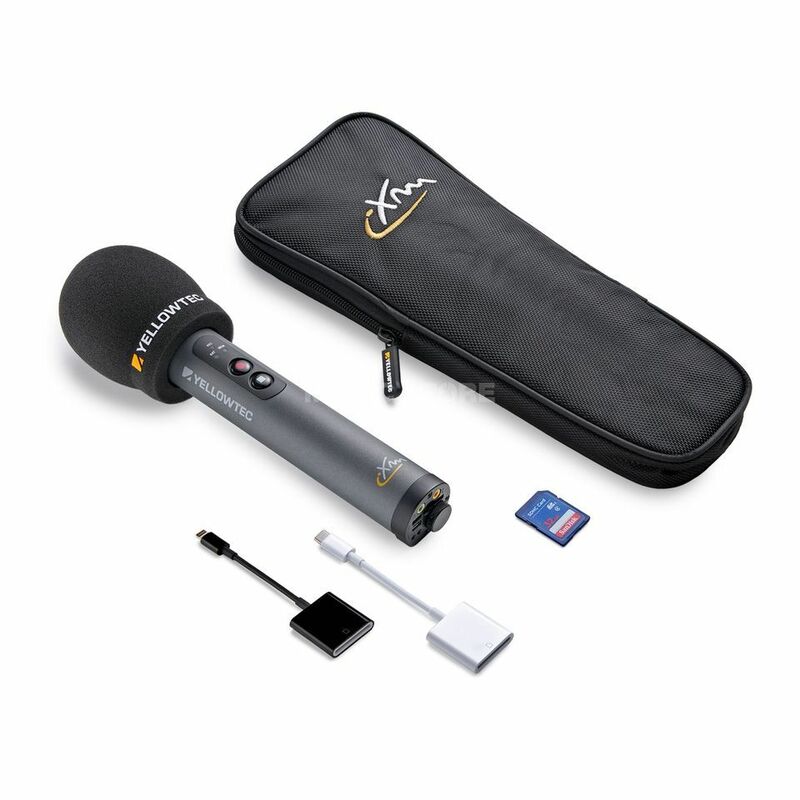 The Yellowtec iXm digital recording microphone is a professional handheld all-in-one recorder for reporters in the field. Featuring a built-in SD card slot that accepts standard SD or SDHC memory cards, iXm provides perfect auto levelling by way of its unique LEA engine. The iXm's microphone capsule has been optimised for high speech intelligibility and low handling noise sensitivity. It is twist-off-twist-on exchangeable and designed to suit varying recording environments. Omnidirectional, cardioid and supercardioid pick up patterns are available, and the capsules are automatically detected for automatic gain and DSP adaption. The Yellowtec iXm utilises an intelligent levelling algorithm the combines a slow-acting gain leveller with a look-ahead peak limiter and avoids ADC distortion by converting the microphone signal twice. The Uplink recording app that facilitates the exchange of data between the iXm microphone and iOS devices like the iPhone. Uplink provides sophisticated editing, archiving and meta tags features and enables reporters to email recordings directly to the studio after tagging the files. A unique dual power concept offered with iXm provides a total operation time of up to 16 hrs. It comes with a built in, rechargeable li-on battery and features a redundant battery compartment for three standard AA cells. Its port panel holds a USB 2.0 port for downloading recordings or recharging an internal battery. Three intuitive indicators are featured on the mic’s dashboard: Record Ready - Recording, battery status and memory status. Files are stored on the SD card as WAV, BWF or MP2. This iXm mic also ships with a mic head, CD with admin/setup software, wall type charger with intl. mains adaptors and a USB cable.